Yesterday I discussed the idea of Casting The Doorknob Society movie. It generated a lot of fun responses here and on Facebook. So I decided to continue it with a few more characters with some of my own suggestions as well as other peoples. Slade- For me the part of Slade needs to be filled physically as he is very well built and carries himself strongly in everything he does. Kellan Lutz has been mentioned and I do feel he has the right look, acting wise I have only seen him with small parts in the Twilight movies. Ms. True– She needs to have a level of menace that just seeps out of her every appearance. I like Christine Adams for the part, I’ve seen her work in many things. But she was rather ominous in Terra Nova which puts her over the top for me. I also like Antonia Thomas from the British show Misfits, she is a wonderful actress though a bit young for the part. Elijah Masters- For Eli I would love to see a good character actor someone like Thomas Jane would be a very interesting choice for the role. 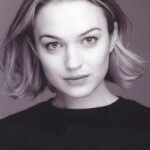 Talia Grimm-Masters- A hard part to pull off, I like the actress Sophia Myles for the part. She was good in the short lived Moonlight TV show and has the acting ability to pull off the nuance needed for the role. Though she is a bit young for the part. Charlize Theron was also mentioned and I really would enjoy her for Talia, she was very menacing yet sympathetic in Snow White and the Huntsman. Once again let me know what you think and give your suggestions. I think Charlize would be good as the mom, especially after book 4! Christine Adams is just how I pictured Ms. True! Slade I am still mad at. Slade has his moments, trust me.